The virtual reality headset has quickly been gaining traction in the technology industry as of late. It is no longer something you see in technology trade shows, they’re readily available, and the prices have never been more affordable. 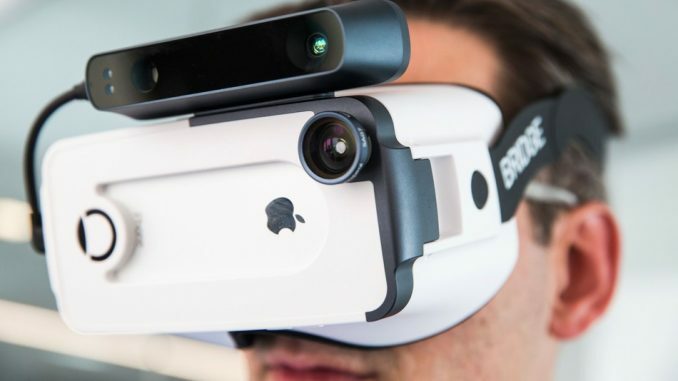 However, with all of this buzz around VR hardware, it seems that Apple is still reluctant to jump on the bandwagon. The reasons for this are not immediately apparent; surely it would do the company well to introduce a product for a technology that has so much hype around it? Whatever Apple’s reasons are, the fact remains that iPhone owners still don’t have an official VR headset available for them. Does that mean that they’ve been entirely left out of the VR revolution? That’s not quite the case. There are virtually countless mobile VR headsets, to choose from when it comes to smartphones. What’s more, most of these are compatible with the iPhone. Even the humble Google Cardboard can be used as a VR viewer for the iPhone. So while there’s still no word from Apple on when the official iPhone VR headset will be available, owners of the smartphone have a lot of readily available options to choose from. In this article, we’ll be looking at the right VR glasses for your iPhone. What about the Oculus Rift and HTC Vive? Can you use the cutting-edge Oculus Rift and HTC Vive VR headsets with your iPhone? The simple answer to that is no. Mobile processing speeds are not up to par to drive the graphically-intensive tasks required for the Oculus Rift and HTC Vive. These are actual VR headsets that rely on robust desktop computers to do the job of processing. The headsets that work with the iPhone and other smartphones are merely “VR viewers”. They house a pair of special lenses that project the VR content displayed on the phone’s screen to your eyes. The VR experience these headsets offer can be best described as an introduction to the world of VR. It’s still an entirely new experience though, and if you’ve never tried VR before you will enjoy it. One of the most appealing aspects of mobile VR headsets is the fact that they can be had for as little as just 15 dollars. Now, of course, a 15-dollar headset will predictably have the questionable build quality and a less-than-favourable viewing experience. It depends on what you think of VR technology. If you’d like to invest in a VR headset that will last you a long time, we would recommend getting one of the more expensive options out there. A cheap headset might be easy to buy, but you will quickly grow weary of it due to the lack of comfort and ergonomic considerations in its design. Mind you, when we say expensive mobile VR headset, we’re still looking at a price of less than $100. That’s a far cry from the prices commanded by full-fledged tethered, VR headsets like the Oculus Rift and HTC Vive. If you have a passing interest in VR and aren’t sure whether you would be interested in it all that much, consider investing in the most basic and cheapest available option – something like the Google Cardboard. Such a headset will give you a fair idea of what to expect from mobile VR technology and what it has to offer you regarding entertainment. Read more about affordable iPhone VR headsets. Mobile virtual reality headsets don’t come any cheaper than the ubiquitous Google Cardboard. This headset was launched at a time when popular headsets like the Samsung Gear VR were selling for upwards of $50. It’s fair to say then, that the Cardboard which cost just $20, shook the market up. No longer did you need to own a Samsung flagship smartphone to experience the joys of mobile VR. It was now open to anyone who owned an Android smartphone. The great thing about the Cardboard is that it’s a pretty good VR viewer. It’s lightweight, and it works perfectly well with the iPhone as well. If you’d like to go even cheaper, Cardboard rip-offs can be found aplenty on Amazon selling for under $15. What’s more, these cheaper knock-offs come fully assembled, so you don’t have to fumble around with the assembly. Place your iPhone into the headset, and you’re transported into the VR world. If you want to spend something more than $20 for a better mobile VR experience, the Merge VR goggles should be on your shopping list. It’s been a popular seller in midrange mobile VR headsets and for a good reason as well. The Google Card which is made out of, well, cardboard, isn’t very comfortable to wear. The Merge VR Goggles, on the other hand, isn’t made from cardboard or even plastic. Instead, they use a foam-based construction that leads to a very low weight and a comfortable fit. The foam is quite soft and squishy, and it rests very gently on your face. There’s also an adjustable strap that lets you find the right amount of fit to go along according to the shape of your head. The viewing experience of the Merge VR Goggles is also excellent. It’s got adjustable lenses which means that people who wear glasses will have no trouble viewing content in it. The lens themselves are of very high quality with minimum blurring and distortion around the edges. The headset is big enough to accommodate larger iPhone Plus models, which means it will also work well with the new iPhone X. The Merge VR Goggles also have a neat little trick – they can be paired with the Merge Cube to take on augmented reality. For that, you have to pop out the front panel of the headset and proceed like you usually would. Just install the Merge AR app on your phone and have the Cube in your hand and you’re all set to dive into the world of mobile augmented reality. It won’t blow you away but is another fun way to use the Merge VR Goggles. Are you looking for the absolute best in mobile VR headsets? Do you prioritise comfort and quality above everything? Are you prepared to shell out some extra cash to do so? Well, then you simply have to look at the Carl Zeiss VR One Plus. It’s the most expensive mobile VR headset out there and claims to offer the best mobile VR experience. Carl Zeiss is a renowned lens manufacturer, and some of that expertise has found its way into the VR One Plus. The lens used in this headset is said to be optically correct and without the usual issues that plague cheap mobile headsets. It looks great as well, with a polished and understated design that will look great on your iPhone. The fit is very comfortable thanks to the foam lining on the back of the headset. All models of the iPhone will fit in the One Plus perfectly. Even without any official VR headset from Apple, the iPhone has a great selection of VR headsets thanks to the popularity of VR in the mobile industry. And this is a good thing because Apple will have to come up with a very competitive product to take on these very well-made mobile headsets. The ones we have listed above will give you an excellent mobile VR experience and will suit every kind of budget. If you’ve got an iPhone, these will surely open up a new way for you to enjoy it. For more information on picking the right VR glasses for your iPhone visit our guide to The Best VR Headsets for an iPhone.